Profile 89 regulatory RNAs with this kit that includes reagents for converting RNAs to cDNAs and a primer set for qPCR assays in a 96-well format. All primers have been validated against total RNA from several cell lines and tissues such as HEK293, HT1080, MCF7 (human breast cancer cell line), human fibroblast cells, human fetal brain, human adult brain, iPSC cells, and neural precursor cells (NPCs). qPCR assays marked in blue are for eRNAs, green for lncRNAs and controls are indicated in black. The kit includes four RNA controls for normalization—GAPDH, Actin, U6, and 18SrRNA—as well as assays for FOXO3 and BRD4 to detect eRNAs. While some lncRNAs have endogenouse polyA tails, other lncRNAs do not. 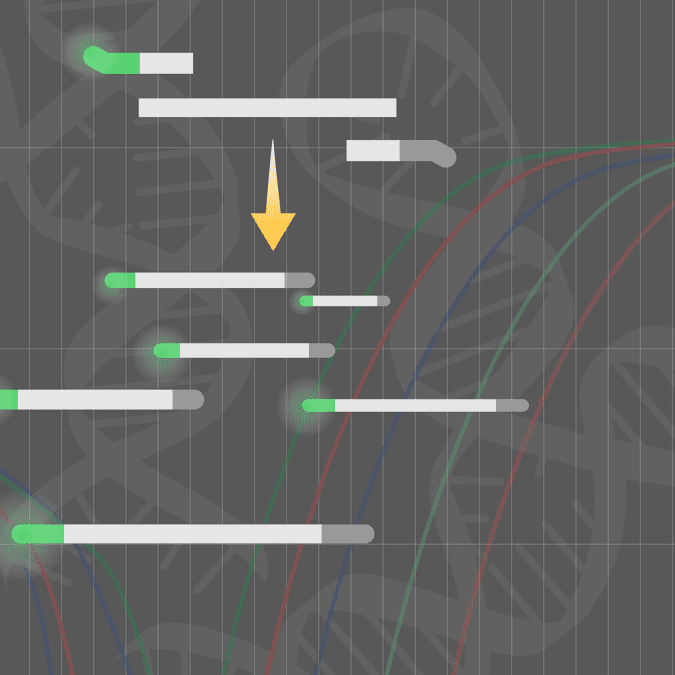 To enhance qPCR assay performance, the cDNA synthesis workflow includes steps and reagents to polyadenylate all lncRNAs before cDNA conversion using the tagged oligo dT adaptor and random primers. This combined RNA tailing and oligo dT plus random primers boosts cDNA yield significantly and enables strand-specific lncRNA qPCR profiling. The result is a cDNA pool of anchor-tailed lncRNAs that are ready for qPCR. Figure 1. Sample dissociation analysis curves. Figure 2. Profile regulatory RNAs in cancer. Representative eRNAs and LncRNAs that are significantly up regulated in cancer cells. RNA from HFF (normal) and HT1080 (cancer) cells were purified, converted to cDNA and the cDNA was profiled for expression using the regulatory RNA profiler. Figure 3. Detect regulatory RNAs in exosomes. After isolating exosomes using ExoQuick (Cat.# EXOQ5A-1) and then exosomal RNAs using SeraMir (Cat.# RA800A-1), we converted the exosomal RNA to cDNA using the Exosomal RNA was converted to cDNA using the RNA-Quant kit (Cat.# RA430A-1) and profiled using the Regulatory RNA qPCR Profiler.